Muir Skate's new video for the new Muir Mini! 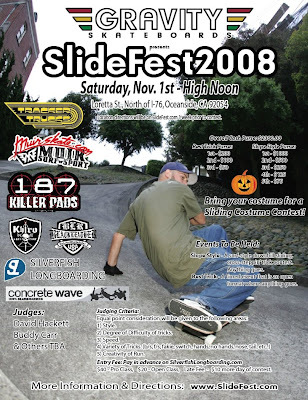 Check out the video from Slidefest 2008! Buy the Loaded Dancer Deck here! 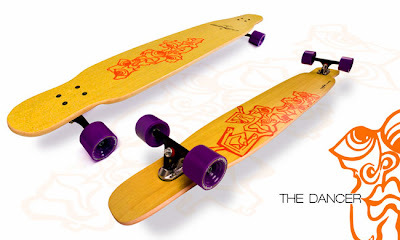 Buy the Loaded Dancer longboard skateboard Complete here! WHICH DANCER FLEX TO GET? If you weight falls between 160-170 lbs and you are really going to ride hard, do a lot of body varials and big jumps you want the FLEX 1. It will function better with your riding style and will have a less risk of bottoming out. If you are lighter than 160 and you are going to be skating super hard the Flex 2 will work but if you prefer a stiffer ride with hardly any flex then get the Flex 1. ● 55” X 9" with a 40” wheelbase. ● Pressed with 100% natural linen using a high performance, non-toxic epoxy resin. ● Small nose and tail curvatures to lock your feet in. ● Nominal camber to keep the board damp and stable. ● Adam C. original monster artwork top and bottom. ● Bubbled bottom texture for finish and durability. ● Different color linens are used at random to keep you on your toes. HOW DOES THE DANCER SHAPE WORK? ● 55 inches long: a good dancing length, providing plenty of foot room. But it’s not way huge and clumsy. The dancer may even loose a few inches in the future. ● 9 inches wide: a nice size to allow plenty of foot room while still allowing you to find the edges easily and quickly. ● The nose and tail curvatures are KEY. These subtle features really help with nose manuals and shovits and are a huge adavantage over flat noses and tails. They are mellow and comfortable and really lock your feet in--giving you that extra leverage you need. Let’s face it, throwing around a 55in board is not easy. Having a little extra leverage is nice. ● Nose and Tail shape: The Dancer is not symmetrical and is built like this for a reason. The nose and tail can perform the same tricks, but each has its own advantages and feel which is nice. The nose of the board is wider and shorter and is easier for nose manual tricks. The back tail is longer and narrower making it easier to get leverage for shovits. Plus a longer tail helps with manuals, providing that extra bit to scrap the ground if you mess up. ● The wheel cut outs and wheel wells combined together make it very hard to get wheel bite. We feel it is important to be able to carve like a tiger on your dancer. We just didn’t want you to have to worry about wheel bite and adding tons of risers. Rest assured, the wheel cuts out are placed as wide as possible (while still preventing wheel bite) to give you maxim foot space. ● Flat platform: No concave (and almost no camber). We made this board flat to bring it back to the original roots of our flat-homemade dancers. Flat platform for ultimate dancing comfort. Also, the flatness helps disperse the thrashing the board gets flipped on its back. Developing a flat board with a long wheelbase and the right amount of flex was very challenging and one of the reasons it took us so long to launch this board. In the future we may add slight concave to make the board even lighter--time shall tell. ● Camber: Very minimal camber along the length of the board to keep the flex positive and the board damp and stable. WHAT IS THE DANCER FLEX LIKE? The dancer does not have a trampoline like flex. It has a damp flex that enables you to have a very comfortable ride while still being able to do boardwalking and manual moves with ease and comfort. HOW DOES THE BOARD BREAK IN? With heavy use, the dancer will become slightly softer over time. However, it will not be a dramatic change. The board is pressed with a small amount of camber to help prevent dramatic sagging. WHAT WHEELS DO YOU RECOMMEND? The Dancer off the Loaded site will come stock with 70mm 4Prez wheels, we feel a 70mm wheel works the best, but of course you have other wheel options to choose from. Any wheel between 70mm-75mm will work. With a larger wheel you run the risk of getting wheel bite. When the free-ride wheel comes out that will be the new stock dancer wheel. DO I NEED A RISER? We recommend using the Paris trucks along with their standard 3/16th” risers. The risers help absorb some of the shock and vibrations, work with the wheel wells, and provide more wheel clearance. The dancer comes with a clear spray grip, which works very well. Once the spray grip wears off it is a good idea to add black magic griptape--especially on the nose and tail of the board were grip is most crucial. The Dancer is pressed with Adam Colton’s original monster artwork. The monsters will scare away bad energy and make rough roads turn into smooth butter pavement. They like to eat chocolate covered raisins. ● The dancer is made using 2 thick bamboo cores. Bamboo is not cheap. ● The dancer is pressed with 100% natural linen, which is a lot friendlier for the environment but costs more than the traditional fiberglass. ● The cure time for the dancer in the press is 3 times that of a Dervish, so building costs are more expensive. ● It’s a big board, so it requires the use of more epoxy and a lot more time to finish the edges. Make sure to feed the monsters and wrap the Dancer in a warm blanket at night and tell it a 5 minute bedtime story. Practice makes perfect, ENJOY. WATCH THE DANCER video for some inspiration. We just got our new shipment of Enjoi boards!!! Crazy colors, crazy designs, and crazy Pandas! Come in to the shop or hop on the site and check 'em out. 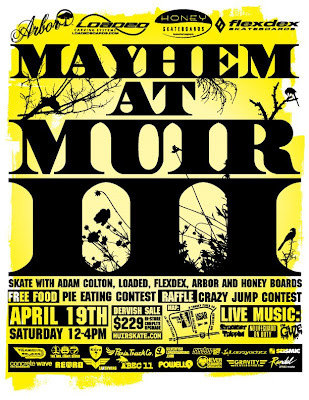 Come check out our welcome back party for you at Mayhem at Muir 4 skate event on Sat October 4th at 12 noon. This event is for everybody. Tell a friend and come by. Flyers will be here and there. Keep Checking back for updates for the Upcoming Meeting times and dates for the 2008-09 Surf and Skate Clubs at UCSD. Don't forget that we take Triton Cash and give you guys 15% off your Surf Stuff and Rainbow Sandals!!! Check out our killer Upgrades on Skateboards. You can read about this stuff on our website. We also Rent Surfboards, bodyboards, skimboards, and wetsuits for super cheap prices. Check out www.muirsurf.com. Oh yeah, I almost for got. We have a surfboard Buy Back Program. You can read about that too! Just ask when you Stop by and we will teach you how to ride a skateboard. Yo Check it out!! Adam Colton and Company put together an amazing downhill video for you guys. 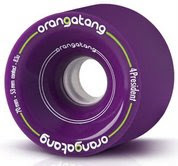 Check out the 75mm 4 President wheels. They are sell like made. They ride super awesome! By the way, check out some of the new features on our website. We are doing a crazy sale for you guys!! All longboards have been marked down by $25 and the Mini Longboards are dropped by $15. As you guys already know, we upgrade all our stuff. Bones Reds are included in the offer for free. We ship for free over $75. The Dervish is upgrade price is around $245. As far as customizing your new board, we are very close to getting this stuff done for you guys. Marc and Sergie are putting in some long hours for you guys. We hope you like the new look for Muirskate.com. We do for sure!! We have lots of Rayne stuff in too! 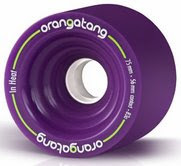 Orangatang Wheels will be in tomorrow with a new shipment of Dervish Decks! Did I mention 3rd Generation Loaded Gloves are here!!! DH Smoke is here too! We are now stocking the entire line of Abec11 and Zig Zags at Muir! Bear 852's Black are in stock!! Black Randals Too! We just have tons of new stuff in stock. Hope you like the new website!! We are constantly improving it for your viewing pleasure! Thanks for coming to the 2008 Muir Skate Summer Jam and Website Release Party! It's Crazy!! Check it out. Marc and Sergie have done it again! You can view the latest reviews from Silverfish and watch the latest video on most products. It is going to take some time, but you will soon view most of the Silverfish Reviews of your favorite products that we offer at Muirskate.com. We are still in the process of completing some work on the site. The best example that is available today is the Loaded Dervish Deck. You can see the 5 Latest Silverfish Reviews, Product description, and the Whirling Dervish Video and never leave our site. You can also join our Blog! Just add your email. When we make an update for an event or product you will be the first to know. Sign up a the bottom of the site. Let us know what you think. Please let us know if you want us to add some features to the site. We have the capability to do crazy stuff. This just in: We are launching our new website on July 19. We are going to have a launch party here at Muir between 12-4pm. We are going to have more details on the event soon! We have done some really cool things for the site that we believe are going to be useful to you. Muir Skate is now Rocking RocknRon's Rockets!! Don't be afraid of this crazy packaging!!! I have been assured that RocknRon's Rockets are the best bearings your $$$ can buy! Tested and approved today. "There is no question that RocknRons Rockets are not only the fastest skateboard bearings but the best bearing value in any skateshop. " Our Muir Mini Blacks 29" is now ready for delivery!!! Come in and test it out. It is freaking sick! We stock it with 5.o Bennetts and 62mmTunnel Wheels. It is so sick that it brings tears to my eyes whenever I step on it. Thanks Sergie for another artistic master piece. Craaaaaaaazy!!! This going to be the craziest 4 hours in the history of Muir Skate!! Come out enjoy the Music, Food, and skate around with some crazy pro guys!